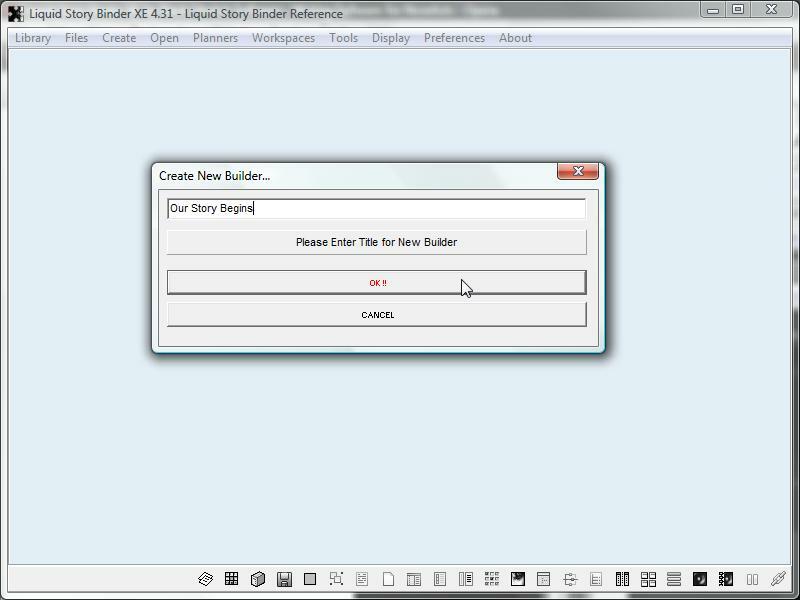 Builder's are the most flexible of the XE file types. 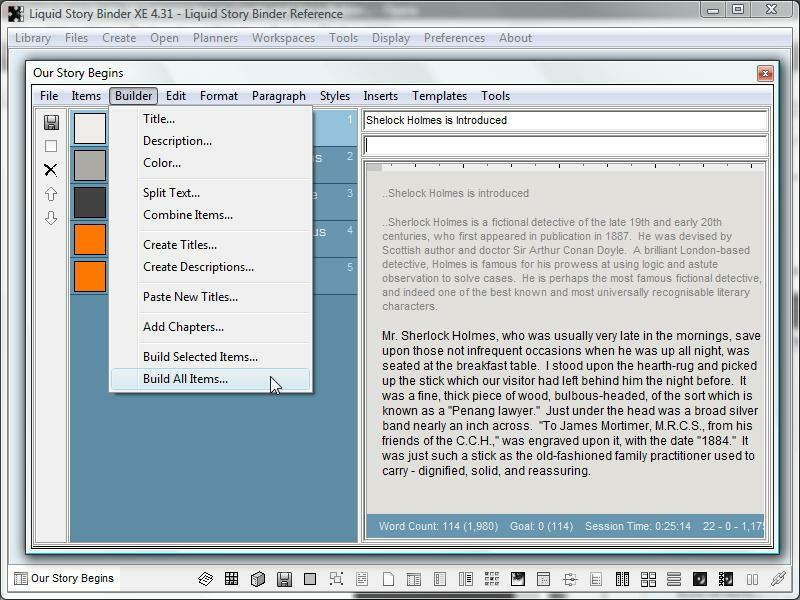 Builders combine multiple rich text documents sorted into a single file with titles, descriptions and color indexing. 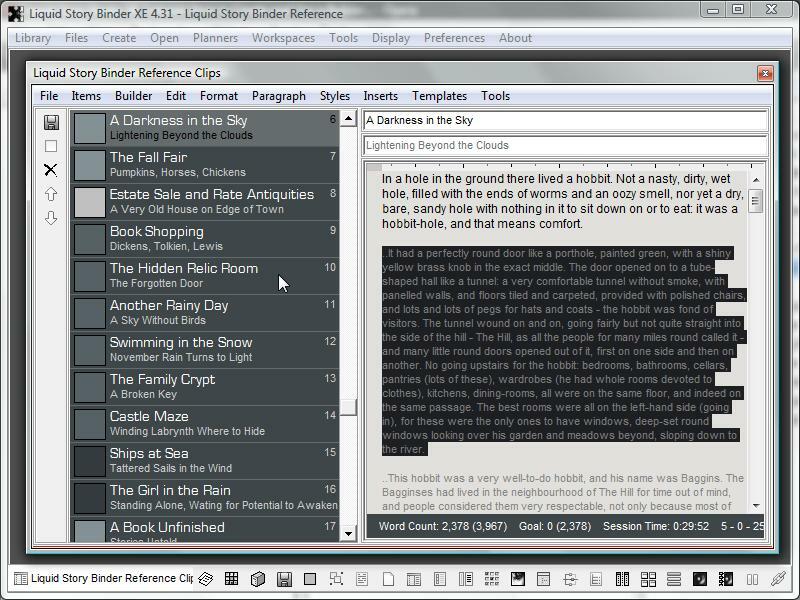 Builders are perfect for organizing complicated storylines with alternating scenes and are a great place to save reference material. 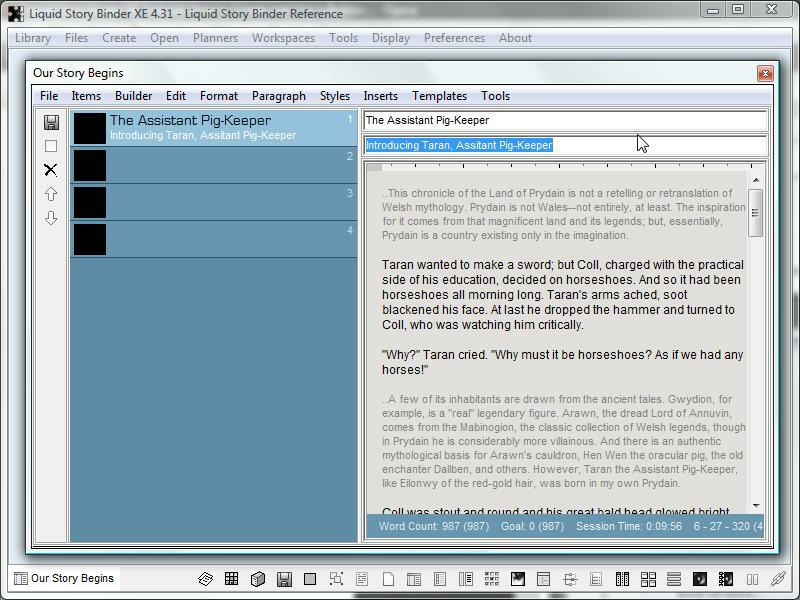 Use a Builder to organize scenes, store clippings, hold research, or use a Builder as a discard bin for worthy paragraphs. To create a new Builder, choose 'New Builder...' from the 'Create' menu. Enter an appropriate title, and press 'OK'. Add items by clicking the 'New Item' icon. Enter ideas by selecting a row, and simply typing in your chosen text. Add detail to each item by adding descriptors. For each entry, a title, description, and color may be assigned. The topmost box allows you to enter the item's title, the second it's description. After saving, the item's title and description are shown in the listing to the right. 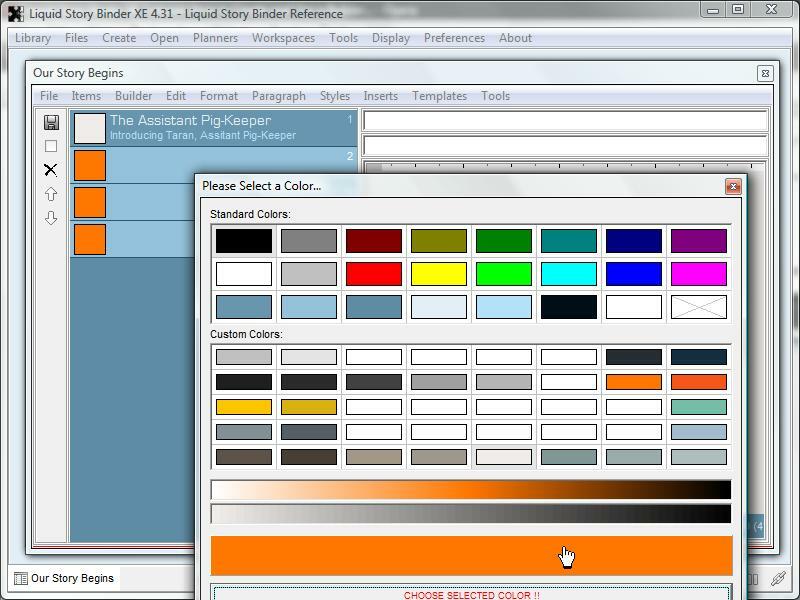 To change the item index color, choose 'Color' from the 'Builder' menu. Notice the indexing color change. Within the Builder item listing, drag the mouse to select multiple items for quick simultaneous changing. 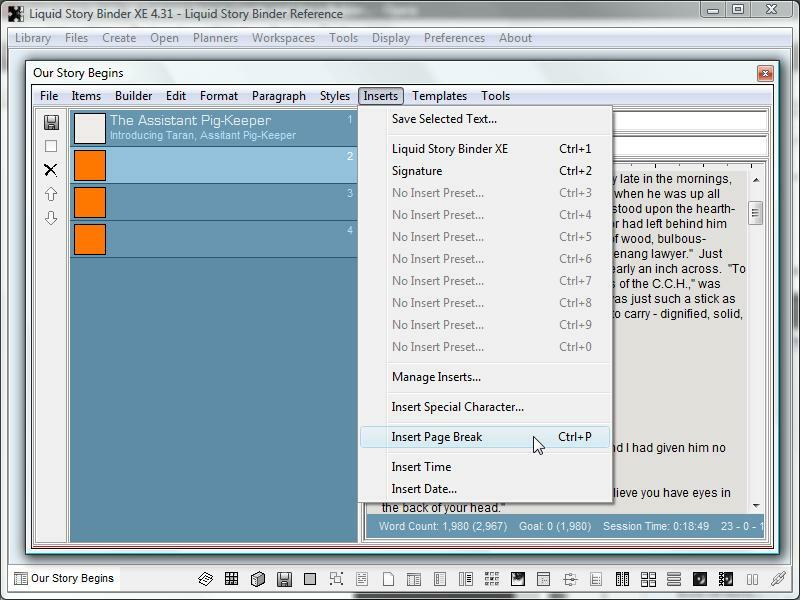 Builder's can be used to spit large existing documents into many separate, manageable pieces. Begin by pasting the desired document into an empty item. 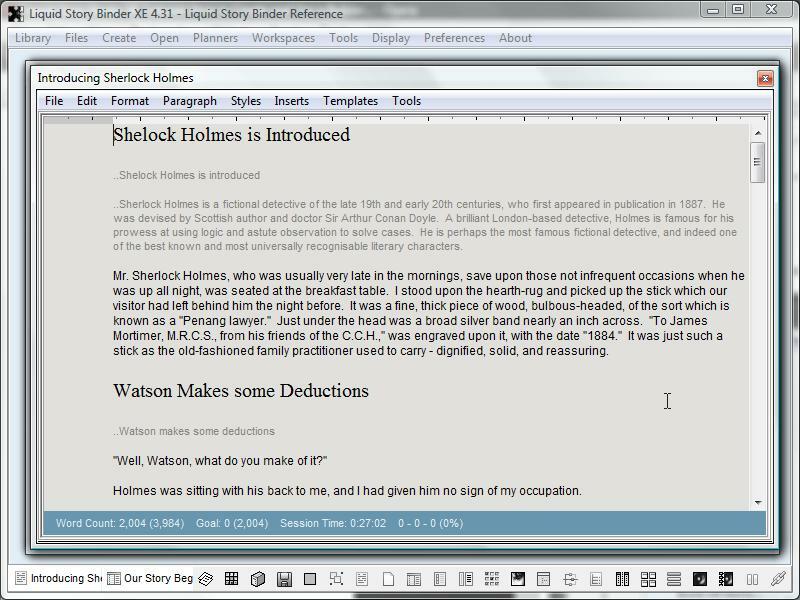 Divide the document by inserting page breaks. 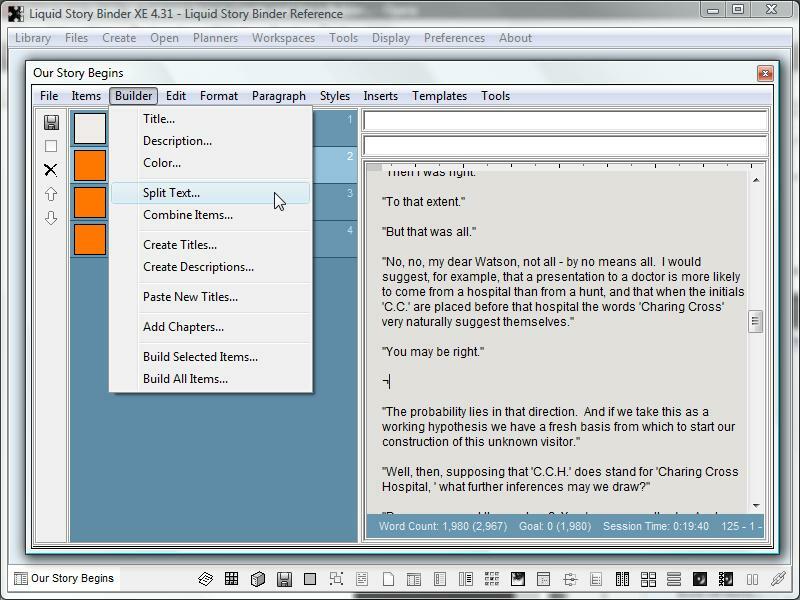 If no page breaks are included, XE will split the document using paragraphs. Now choose 'Split Text' from the 'Builder' menu. 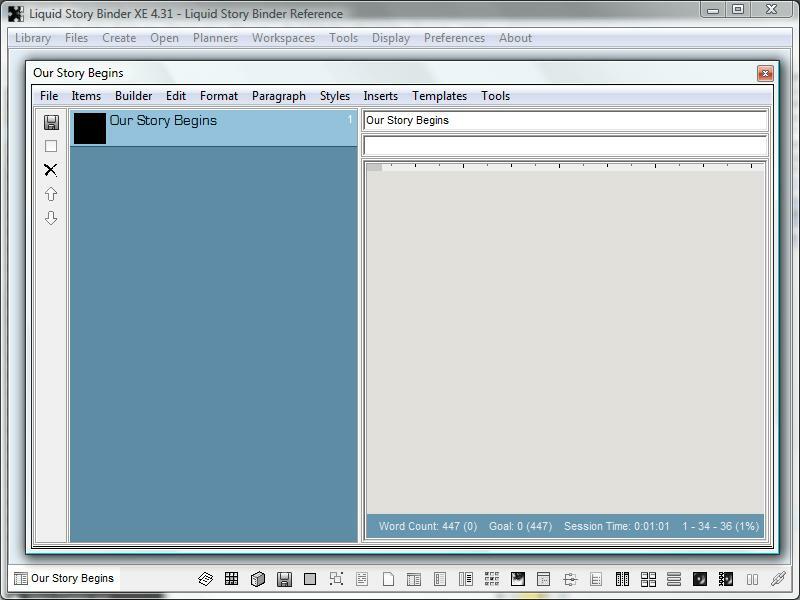 Liquid Story Binder XE will split the document, adding new entries to he base of the Builder listing. Entry titles are automatically created. The original document entry is left intact. 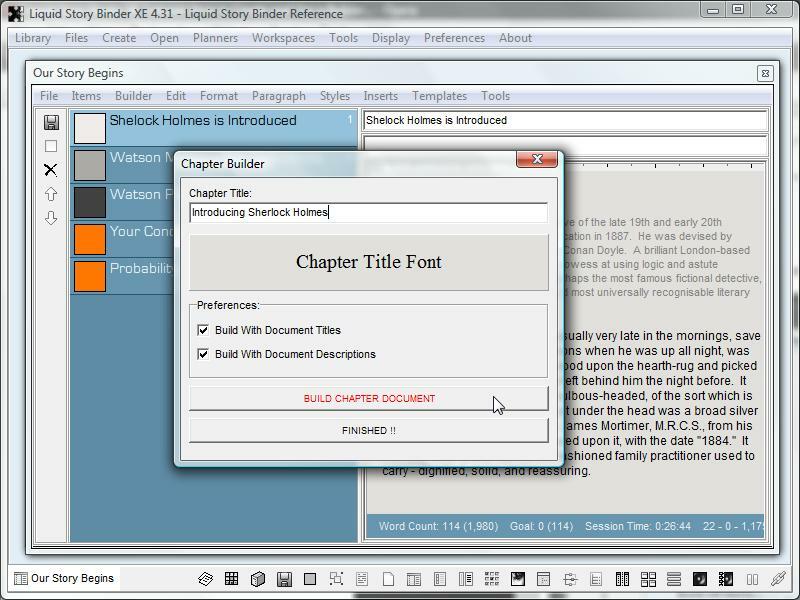 Builders can automatically combine multiple documents into a single, unified Chapter. 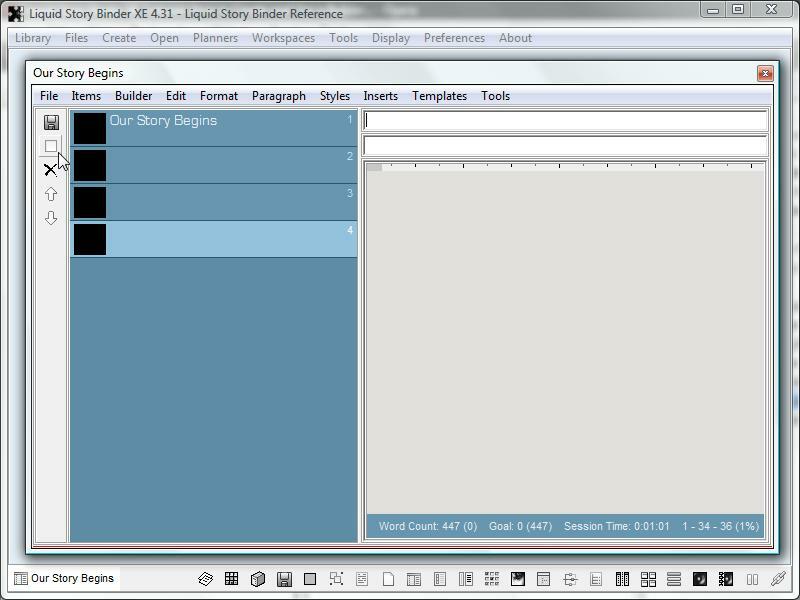 Use a Builder to arrange complicated scenes, are divide a large Chapter into manageable parts. Select 'Build All Items...' from the 'Builder' menu. 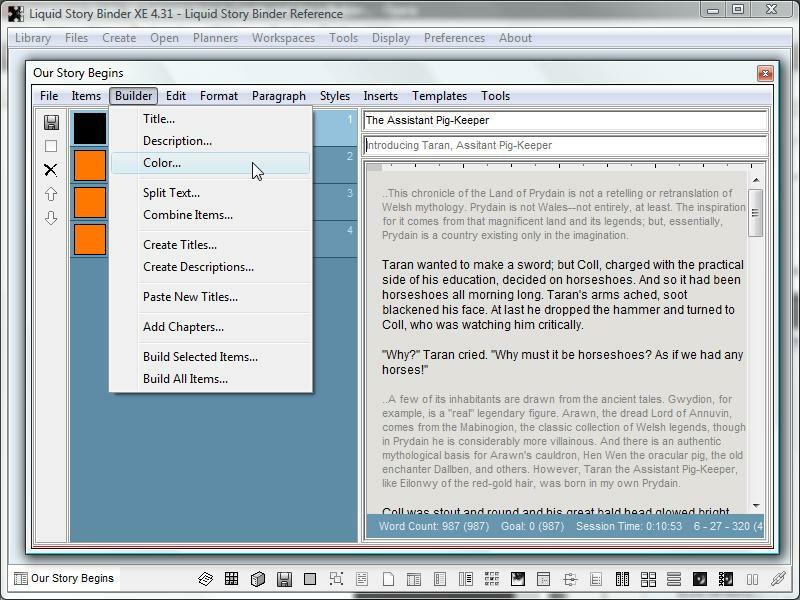 The Chapter Builder will open. Enter a title for your new Chapter. 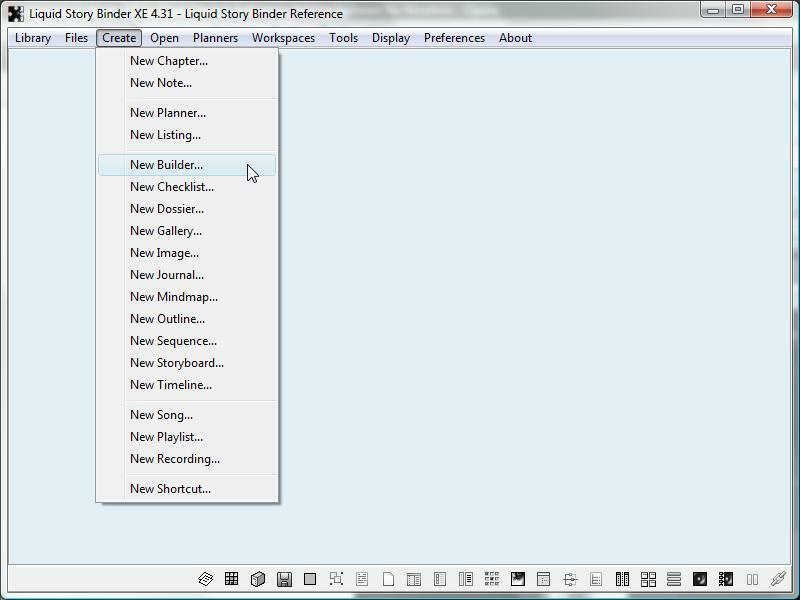 To add document titles, select 'Build With Titles' and 'Build With Descriptions' from the Builder's 'Preferences' menu. The Builder items are combined to form a single, unified Chapter. The new Chapter, including entry titles, opens ready for further editing and Manuscript Building. 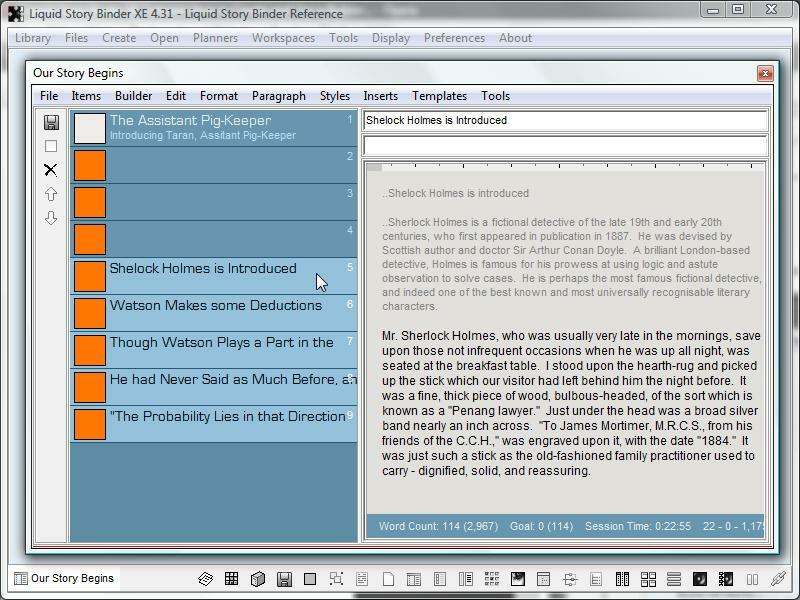 Use a Builder to collect and store important clips, well-written deleted content, or like-themed text such as letters.